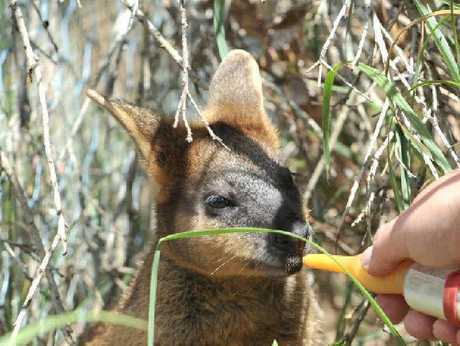 HE LOST his mum, was hunted by a pack of dogs and almost drowned, but now Lucky the joey swamp wallaby is moving on with his new life. 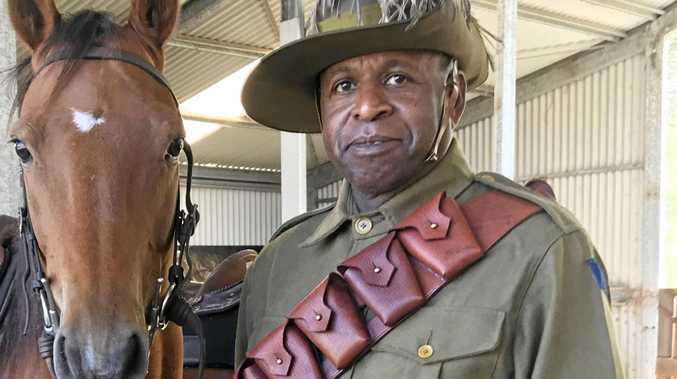 Lucky was miraculously resuscitated on the banks of Byron Bay's Belongil Creek in September after throwing himself into the creek to escape a pack of roving hounds, before getting fished out by Melbourne tourist Mick Hussin. The plucky young survivor has since been lovingly nursed back to health over the last six weeks by WIRES carer Renata Phelps. Aged eight months and weighing 1.6kg upon his arrival, after many bottles of milk he has now reached a healthy 3.5kg. He has made friends with fellow orphans Kia, Electra and Tabby, and is expected to be released into the wild early in the new year. "He's a great little character," Ms Phelps said. 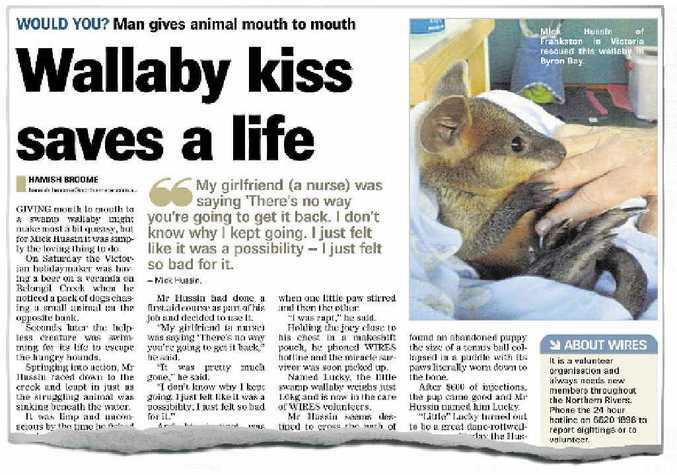 The Northern Star’s coverage of Lucky’s rescue. "They all have their different personalities. He loves hiding in the bushes during the day but at feed time he'll rush out and get his bottle." Lucky is living in a nursery pen now, but will be gradually moved to the big yard and eventually a "soft" release where the gate is left open but he is not forced to leave. He is starting to learn things vital to his survival in the wild, such as awareness of threats, how to hide, and becoming fully independent. "He's a very lucky boy. 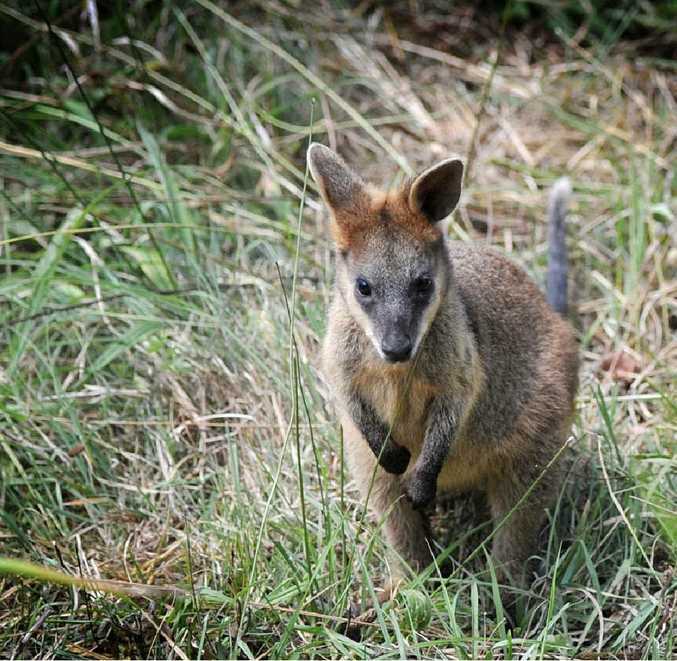 When wallabies or kangaroos are chased by dogs like he was, they develop a stress response called myopathy," Ms Phelps said. "It's a horrible slow death; their organs shut down from the chemicals released in the body from the stress event. "He may have got a little bit of mild myopathy, but because he came into care very quickly, we give them huge amounts of liquid to flush out all those chemicals. "Out in the wild without that help, he may not have made it."